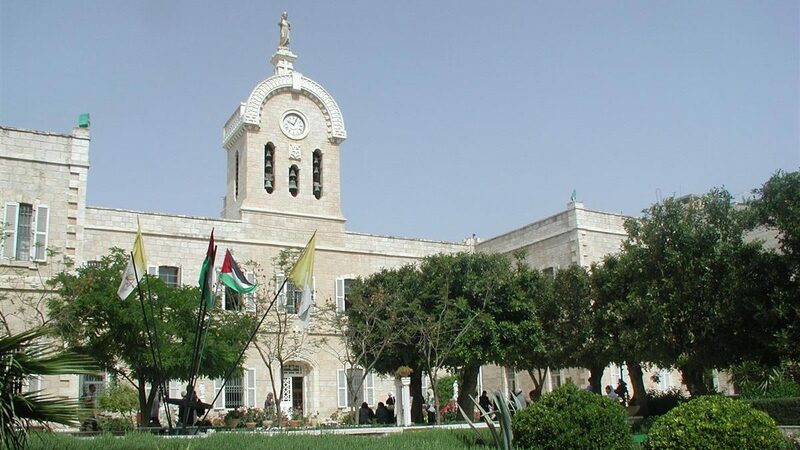 Bethlehem University of the Holy Land is a Catholic Christian co-educational institution of higher learning founded in 1973 in the Lasallian tradition, open to students of all faith traditions. Bethlehem University, the first university established in the West Bank, can trace its roots to when the De La Salle Christian Brothers opened schools in Bethlehem, Jerusalem, Jaffa, Nazareth, Turkey, Lebanon, Jordan, and Egypt. Bethlehem University is a place of higher learning that came into being in 1973 following the historic visit of Pope Paul VI to the Holy Land in 1964. This visit had been a great boost to the local people and stimulated religious fervor and Christian pride. The rather circuitous route from this visit to the establishment of Bethlehem University originated with the desire of Pope Paul VI to do something to help the Palestinian people, but it was very unclear what that would be. The Palestinian people had many needs and in the late 1960s they were faced with the Israeli occupation and the implications of this. There was an ongoing exodus of Palestinians and those who stayed were facing significant restrictions, the lack of housing, no university education possibilities within Palestine, and difficulties in getting employment. Those young people who wanted a university education had to go outside Palestine to get it. Apart from the exorbitant cost to parents in following this route, many of those who went did not return to contribute to Palestine. Monsignor Pio Laghi, the then Apostolic Delegate of the Vatican in Jerusalem, began exploring this exodus and talking to people about ways to stem it. In 1971, he called a special meeting of the principals of the Christian schools in Jerusalem and Bethlehem and informed them that the Vatican wanted to put in place a project to be of benefit to the Palestinian people in line with Pope Paul VI’s wishes. He asked the principals for suggestions on where such a project might be placed, even though the nature of the project was still unclear. At the time Monsignor Pio Laghi called this meeting there was still considerable fear among Palestinians about what the implications of the Israeli invasion and occupation would mean, as it was still the early days of the occupation. There was a reluctance on the part of the Palestinians to send their children to the occupier’s universities and there was no encouragement from the Israelis for this to happen. The challenges facing Monsignior Pio Laghi in seeking to implement the request from the Vatican, was to clarify what the project would be and then find a place for it. The Patriarchal schools were constantly in need of teachers, so there was an initial suggestion that it would be helpful if there was a teacher training college to provide such teachers. A small committee of principals of Christian schools and a few other people, discussed the concept of a teacher training college, but it seemed to them too cautious and restricted to be of great benefit to the Palestinian people. There was no registered university in Palestine at the time so in January 1973, Brother Jean Manual FSC, who was then principal of Collège des Frères at New Gate in Jerusalem, suggested establishing a university as a way of implementing Pope Paul VI’s gift to the Palestinian people, and offered, on behalf of the “Proche-Orient” district of the De La Salle Brothers, the use of their Bethlehem property for this. The property at that stage was used for the École des Frères, the school established in Bethlehem by the Brothers in 1909. This proposal was put to the Vatican and several weeks later the committee received word that the Vatican had accepted the idea of creating a four-year University. So, in the Spring of 1973, after the Vatican had decided that the nature of the project with which Pope Paul VI would help the Palestinian people would be in the realm of higher education, the Vatican approached Brother Charles Henry, the Superior General of the Brothers, to discuss how this might be achieved. These were changing times for the Brothers. “The General Chapter (an assembly of representatives of the Brothers from all over the world), held in Rome (in 1966), took a number of decisions which impinged, in a radical way, on the mentality of the Brothers, their basic rules, their way of life, and on several other domains related to their work of conducting schools and institutions of higher learning.” In short, when the Vatican approached Brother Charles Henry, FSC in 1973, the time seemed right for the Brothers to collaborate with the Vatican and local Palestinians in setting up Bethlehem University. It was to be a joint venture between the Vatican and the De La Salle Brothers in which the Vatican would provide some financial assistance and the Brothers would provide the administration of the University. So, on 1 October 1973 three Brothers joined with a group of Palestinians and 112 students to begin Bethlehem University, the first registered university in Palestine. The Brothers and their colleagues have conducted schools in over 118 countries of the world since 1680. They have been involved in universities in the United States since 1853 and in schools in the Middle East since 1876. The first building Bethlehem University occupied was constructed in 1893 as a novitiate, a place to introduce young men into what it meant to be a Brother. Later it became an administrative center for the Brothers and a retirement center for older Brothers and in 1909 it became a school. Bethlehem University was established on the site and opened its doors on 1 October 1973, becoming the first registered university in the West Bank. The University is located on 8.67 acres (35 dunams) of the De La Salle Brothers property on Frères Street at the highest point in the town of Bethlehem. Beginning with 112 students during its first year in 1973, sixty-three students graduated at the first full graduation ceremony in June 1977. The enrollment of the University increased steadily reaching 1,000 in the Fall of 1981, over 2,200 by Fall 2000, and establishing a record high of more than 3,200 currently. The University expanded its facilities to meet the needs of the growing student body: Library in 1978; Mar Andrea Women’s Hostel in 1979; Science Wing in 1980; Social and Cultural Center in 1990; the Institute for Community Partnership in 1991; Bethlehem Hall for the Nursing and Education faculty in 1995; Turathuna: Palestinian Cultural Heritage Center in 2000; and Millennium Hall for the Arts, Business Administration faculty in 2002, and the Building of the Faculty of Education in 2011. The highly academically qualified and dedicated Palestinian faculty and staff along with their international colleagues of lay men and women, De La Salle Christian Brothers and members of various religious orders of sisters and priests, grew to meet the developing needs of teaching, research, community service and administration at the University. The Education Faculty and the Institute for Hotel Management and Tourism were among the University’s first distinctive programs. The Faculties of Arts, Science, Nursing and Business Administration also grew in response to the needs of the community as did the Institute for Community Partnership, offering continuing education and professional development programs. Despite being closed twelve times by Israeli military imposed orders, the longest of which was for three years from October 1987 until October 1990, classes have continually been held on- and off-campus. The curfews, travel restrictions, military checkpoint harassment, and the negative impact of the Israeli military occupation of the West Bank, are factors faced by the University’s enrollment of 3,290 students, most of whom are full time, and more than 16,000 graduates, most of whom are serving the Palestinian society in the West Bank, East Jerusalem and Gaza in various professions and leadership positions. The University’s story is one of people committed to pursuing their higher education – perseverance and courage in the face of adversity and injustice – working together in hope with an ever-widening international circle of colleagues to build a better future. Today, the large Lasallian family is formed by nearly 4,000 Brothers, who together with over 93,000 men and women teachers and numerous other Lay associates help in running nearly 1,000 education centers, in 79 countries. Worldwide, over 1 million students, children, youth and even adults, receive the best education available in Lasallian educational establishments.